This is my second time attending the Singapore Do, although the event itself has been around quite a few years. 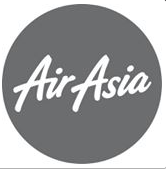 I learned last year that typically after the main event in Singapore, smaller groups fly to other locations in Southeast Asia for an ‘After-Do’ get together. 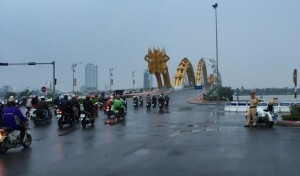 This year the organizers decided that the After-Do location would be Da Nang, Vietnam. Sometime last year, Vietnam began popping up on my radar as a place I might like to visit. The country itself has even stepped up its tourism campaign with the creation of the “Exciting Vietnam” Tourism campaign in order to promote itself as a safe, friendly, attractive and exciting tourist destination (and, I might add, a very affordable one). Once I decided I would attend the After-Do, I began a search for tickets. Many of the people who were going to Da Nang had decided to fly on Vietnam Airlines and I figured that would be good enough for me as well. Thinking that I would still be in Singapore, I booked a one way ticket from Singapore to DaNang on Vietnam Airlines for about $140.00. It was only a few minutes after booking that I decided to check my award itinerary before booking a one way to Bangkok. Whoops! My award itinerary was already putting me in Bangkok on Sunday so my flight should have been a round trip ticket BKK-SGN-DNG. Worst nightmare! Booking mistake! 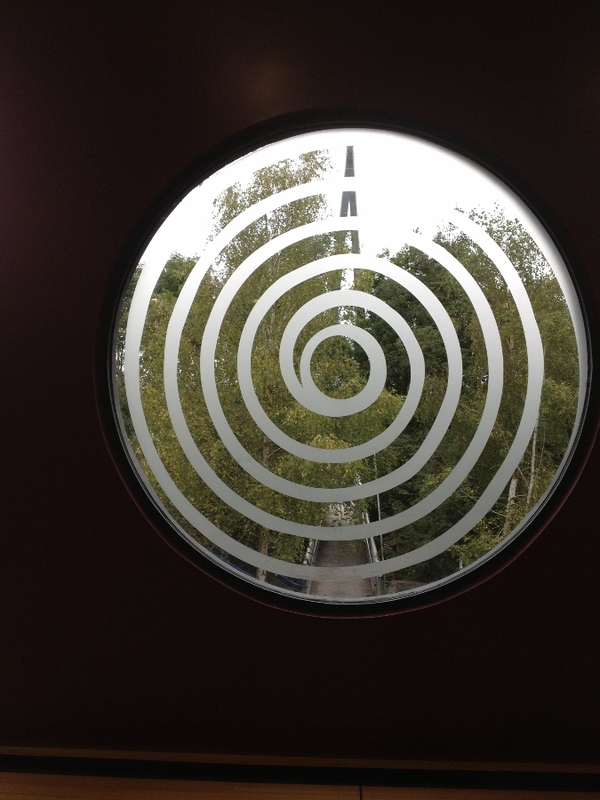 But more on that later…. 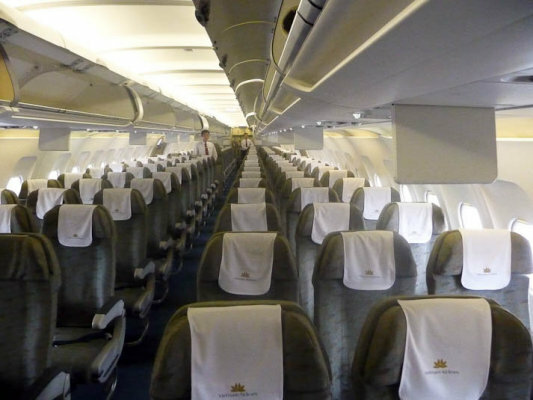 The cost of this roundtrip ticket on Vietnam Airlines was approximately $264.00. I discovered after my flights that only one of the legs qualified for receiving miles in my Delta account because the other three were booked into a lower fare class. 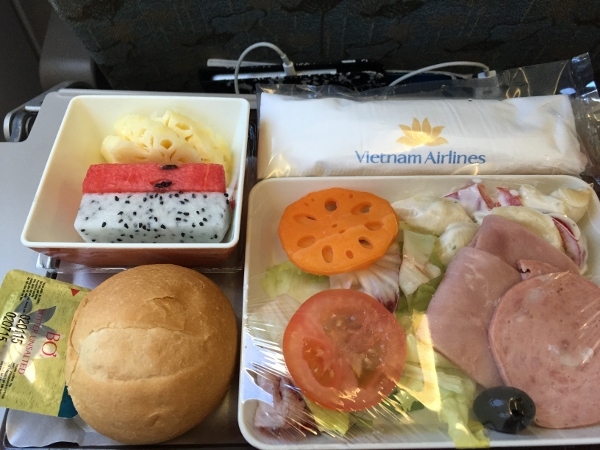 I was really quite surprised and pleased with the service on Vietnam Airlines. Vietnam Airlines (VN), was founded in 1956 and is the national carrier of Vietnam, with hubs at Hanoi’s Noi Bai airport and Ho Chi Minh City’s Son Nhat airport. I am only going to give a general overall view of these flights because, quite frankly, they were all very similar with nothing outstanding about any of them. The aircraft used for all of my flights was the Airbus A-321 and although most of them seemed to be a little on the old side, at least the interiors were clean. I just couldn’t justify spending the extra money on business class for such short flights – and do not regret saving the money. However, I don’t think Vietnam Airlines has gotten the memo about reduced seat space for travel in coach. Even though I was sitting in the middle of the coach section, Row 18 or Row 24, there was plenty of room compared to US carriers. A meal consisting of a salad, sliced ham, a warm roll and a fruit dish were served on the both of the longer Bangkok routes. Service was both efficient and quite courteous. 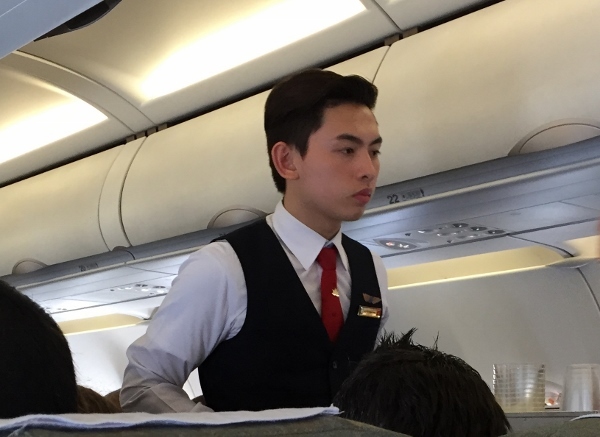 The flight attendants from Bangkok to Ho Chi Minh City were all male which surprised me a little. 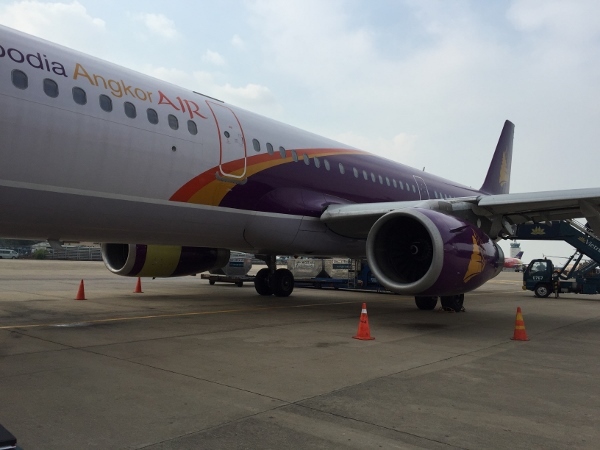 On the flight from Ho Chi Minh City to Da Nang, I was surprised to note that the aircraft livery was that of Cambodia Angkor Air. The plane was parked at a remote site and we boarded after taking short bus ride from the terminal. 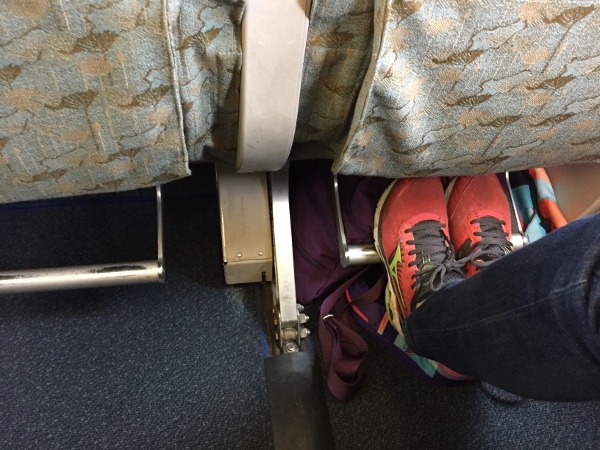 For this flight, I was sitting a little closer to the front and the seat even had a footrest! The only service on that flight was a drinks service of soda, juice or water. There was no inflight entertainment on any of my flights although I understand that longhaul flights have seatback monitors with limited selections. 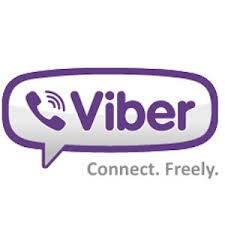 I was kept busy, however, chatting with a delightful seatmate – a doctor from Bangkok who was flying with a small tour group on to Hanoi and some of the other Northern villages of Vietnam. If I were to travel around Cambodia and Vietnam in the future, I would not hesitate to fly with Vietnam Airlines. I would just make sure that my ticket was not the ultra-low saver price so that some of those miles could be credited to Delta! 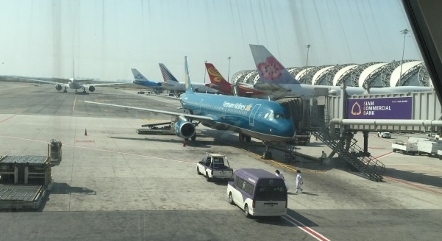 2 Comments on "Flying Vietnam Airlines – Bangkok to Da Nang"
you could book with Flying blue miles transfer from MR. these short flights cost around 10k(OW) miles and $50 in tax. Thanks for the tip! A great tip for others who may be going…. I’ll keep that in mind the next time I visit Vietnam.